How to float the Deschutes River like a pro! Whether you’re drawn to Bend by the breweries, the hiking trails, or the mountain biking, there’s one activity that’s almost certainly on your to-do list if you visit between June and September: Floating the river. I know this because previous blogs I’ve written on the subject remain our most highly-trafficked posts even seven years later. Since the rules and even the river change from year to year (more on that in a sec! 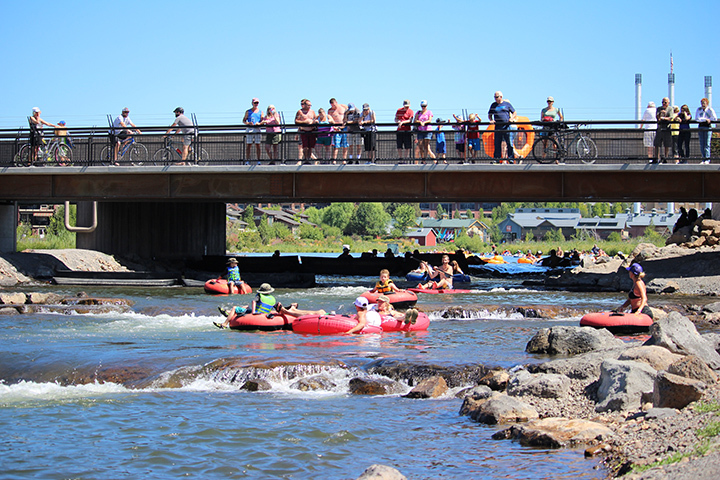 ), it’s time for an updated, latest-and-greatest blog post featuring everything you need to know about floating the Deschutes River in the summer of 2017. Having the right gear is a crucial part of having fun floating the Deschutes River. A high-quality inner tube or floatation device. While you’ll see plenty of folks out there on pool toys, that’s risky if you want to cruise through the passageway channel in the Bend Whitewater Park. Rocks and rapids lead to popped and tumbled cheap floaties (which leaves us with garbage bins stuffed with ruined inflatables). 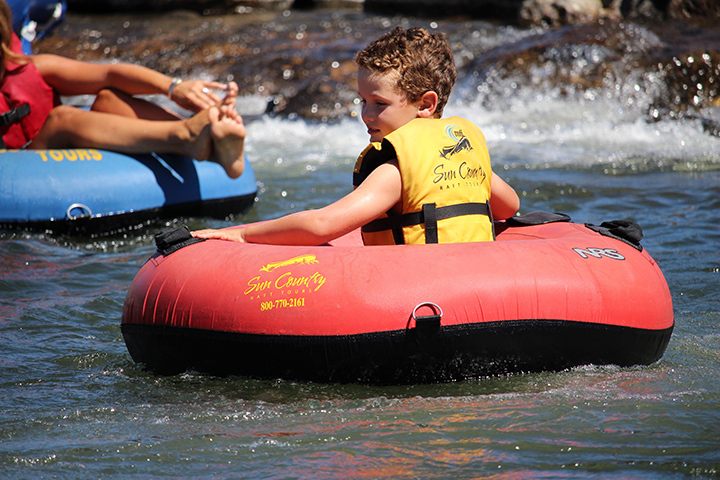 You can rent durable float tubes from a number of local retailers including Sun Country and Tumalo Creek Kayak & Canoe. I’ve witnessed many a ruined vacation when visitors didn’t realize the strength of the sun in our high-altitude desert town. Slather up, guys. You’ll thank me later. Proper footwear. You’ll want something on your feet for hoofing it back to your car or around the passageway, but whatever you do, DON’T WEAR FLIP FLOPS! They’ll come off in the water or mud to become litter in our pristine river. Instead, opt for sturdy footwear like Keens or Tevas. Secure your personal items. Plan to keep your keys, phones, trash and other belongings with you, not on the river’s bottom. Want to ruin your trip in a hurry? Just lose your car keys (or wallet, phone, camera, prescription glasses and so on) in the passageway. No Bueno. Life jacket. State law requires that each boat or paddleboard carry one Coast Guard approved life jacket for each person on board, and children age 12 and under are required to wear life jackets. If you lash several float tubes together, that counts as a boat. Play it safe and snag yourself and the kids a free rental life jacket from the Sun Country kiosk at Riverbend Park. Since the Deschutes River does not flow in a circle like a carnival ride, you need to make a plan before you set foot in the water. While some folks opt for a long walk back to their car, or do the multi-car shuffle by leaving a vehicle at the takeout point, you’ll be much, much happier if you leave the driving to someone else by taking the Ride the River Shuttle. It’ll save you tons of headaches with parking. Nothing beats floating the river on a hot summer day. Keep in mind that if you plan to head through the passageway channel, standard pool toys and air mattresses won’t cut it. Just hop out and jump back in on the other side of the Colorado Avenue Bridge. Now that you’ve got a plan, you’re ready to roll! Most floaters put in at the shallow beach area in Riverbend Park. Paddle out into the water and let the current start your journey downstream. Keep in mind the water is fed by snowmelt and icy springs, so it’ll be chilly even at the height of summer. As you approach the Colorado Avenue Bridge, you’ve got a decision to make . . . In 2015, the Bend Whitewater Park opened at the site of the former Colorado Avenue dam, opening up an access that previously didn’t exist. It has three distinct channels that include a habitat area for wildlife, a whitewater channel for surfing and whitewater kayaking, and a passageway meant for river floaters. Wooohooo! The passageway channel is a fun spot to ride the rapids. If this is your first time through, hop out here and study the passageway. It includes a series of rapids that’ll be a little bumpy and could wreck your ride (not to mention your backside) if you’re not using a sturdy floatation device. If you’re on a flatwater boat or paddleboard instead of a float tube, you’ll want to exit the river here as the rapids will likely damage your boat or board. Feeling up to it? If you’re riding on through the passageway, do your best to keep your feet downstream and your float tube in the whitewater section of the channel. If you have small children with you or if you’d rather walk around it, just hoof it along the portage trail and hop back in the water on the other end of the channel. You can also call it a day at the bridge and enjoy a relatively short walk back to the put-in point. Or you can keep on floating . . .
Got it. Let’s keep going! If you choose to continue floating past the Colorado Avenue Bridge, you’ll eventually find yourself drifting into Drake Park. As you approach the Galveston Avenue Bridge, start making your way to the right. 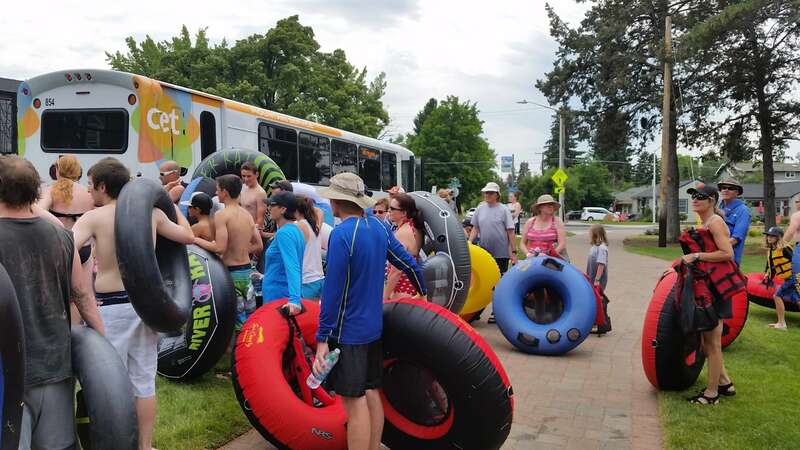 When you finish your float in Drake Park, catch the Ride the River shuttle back to Riverbend Park. Just past the bridge, you’ll see a small beach on the right side of the river. That’s where you’ll want to hop out. And since you already made plans to Ride the River Shuttle, you’ll have an easy time getting back to your vehicle or to the put-in spot so you can do the whole thing all over again. There are local ordinances that make it illegal to drink alcohol on the Deschutes River or in a Bend park, so leave the brews at home. You know what’s also illegal? Sinking your beer cans or bottles in the water. If the cops catch you doing it, they’ll fine you. If a local catches you doing it, you’ll get a pretty serious tongue-lashing about littering and the importance of protecting Bend’s natural beauty. Despite the fact that marijuana is legal in Oregon, it’s not legal to blaze up in public places. Leave the bong behind, guys. Keep in mind that the full float will take anywhere from an hour to 90 minutes. Plan on half that time if you jump out at the Colorado Avenue Bridge. Parking can be crowded at Riverbend Park, but it’s downright insane at Drake Park. Seriously, Ride the River Shuttle. I promise you’ll thank me. Bend Park and Rec offers an amazing virtual tour for how to float the river. You can check that out here. Want a big-picture overview of the Deschutes River and where all the hazards lie? The Bulletin recently ran an excellent graphic you can scope out right here. Want more tips on navigating Bend like a pro? Check out our Visit Like a Local page! Next article: Summer 2017 has arrived in Bend! Now what?